Motorola’s big bet on the Android-powered Droid device may just pay off and help the reinvented company turn its fortunes around. According to estimates release by up-start mobile apps analytics firm Flurry this week, US carrier Verizon Wireless may have shifted in the region of 250,000 Droids during the device’s first week of launch. 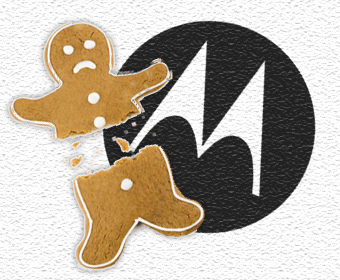 The Motorola Droid, the first Android-based device to use version 2.0 of the operating system, launched on Verizon’s network in the US on November 6, backed by what is believed to be a $100m marketing campaign. Through its analytics service, Flurry monitors usage of over 10,000 applications on the iPhone and Android platforms and claims to track apps two thirds of unique iPhone and Android handsets in the market, including over 15,000 million user sessions per day. 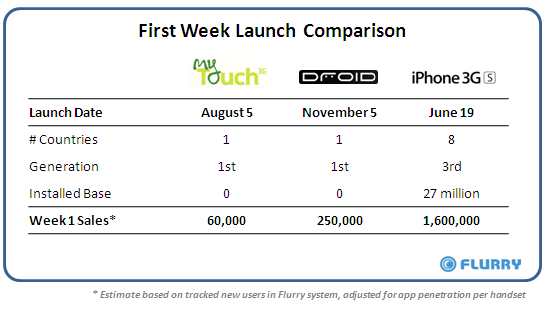 To estimate first week sales totals for the myTouch 3G (HTC Magic), Droid and iPhone 3GS, Flurry detected new handsets within its system, and then made adjustments to account for varying levels of Flurry application penetration by handset. While Apple sold approximately 1.6 million 3GS units over its first week of sales, the device was simultaneously launched across eight countries, while the Droid launched only in the US. Moreover, the iPhone commanded an installed base of over 25 million at the time the 3GS launched, including six million first generation iPhone users who were expected to upgrade to the 3GS. Taking this into account, Droid sales of 250,000 units during its first week from a standing start and in just one country, is a strong result for Motorola and Verizon. Flurry’s statistics also show that the average Android session length is four minutes versus two minutes for iPhone apps. Is that positive for Android or does stuff just take twice as long? The fact that iPhone3GS was launched in 8 countries doesn’t mean its sales was evenly distributed among them. Out of them more than 1 mln iPhones were sold in US alone. Anyway to look, it beat Droid by 1 to 4.